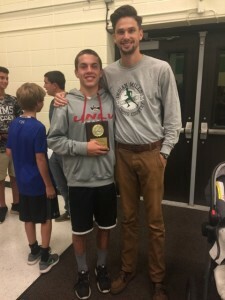 The Indian Mills Memorial Middle School cross country team had a successful season this fall. Twenty-one out of 47 students qualified to participate in the South Jersey Meet of Champions for middle school students last month. One standout was eighth grader Shane Dunn who came in first place — not only at the South Jersey Meet of Champions, but also for every race he participated in this season. It was also the first time at Indian Mills Memorial School a student came in first place at the Meet of Champions. “He didn’t lose a race this season. It was unreal. He is such a smart runner and made me proud,” coach Ryan Davies said. “I just ran the best I could and learned to pace myself. It always feels good to do your best,” Shane said. Shane was not the best runner when he was young, according to his mother Suzanne. Growing up, he was very sloppy and was always lagging behind. However, as he got older, he improved his running and endurance. “We had no idea he would become a runner … He’s evolved into this graceful runner,” Suzanne said. Shane, a basketball player at heart, got started with cross country in sixth grade to make acquaintance with the previous cross country and basketball coach Daniel Giordano and get exercise during the fall sports season. Though Shane is not a fan of running, according to his dad Michael, he has stayed committed to cross country and seen great success. He goes to every practice and occasionally will run around the neighborhood. In his first year, he was a novice. In his second, he moved his way up to the top 10. Now in his third year, Shane earned first place. “He has been phenomenal,” Michael said. Davies said he works with all of the runners to, first and foremost, run the best they can, even if that is just running the whole time at a slow pace. He then teaches students to try to build endurance, do strength training and make strategic moves while racing. Shane was good at knowing when to pace himself and when to kick it up a notch. 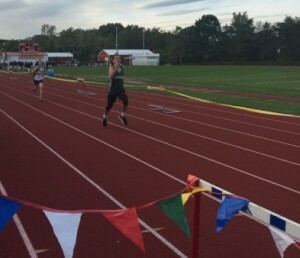 While racing in the Meet of Champions, Shane was in the lead and paced himself to be a little in front of the second-place runner. When it came time for the last stretch, Davies told him to run and he sped up to win by a good distance. Shane said he would like to continue with cross country or track when he goes to high school and be the best runner he can be. His parents agreed; as long as he is enjoying it, they hope he sticks with it. “I hope he continues to enjoy the sport and improve himself in it to see how far he can take it. Plus, it’s a great way for him to stay healthy,” Suzanne said. Shane was not the only success of the Meet of Champions. Ryleigh Heck, Grace Rollins, Wally Pickard, Christian Ciliberti, Liam Trzaskawka, Charlee Grovatt and Gabby Miller were all finishers as well. Heck, a seventh grader, came in third behind two eighth graders and is projected to only get better, and Rollins has really taken the lead on the team, according to Davies. However, he is proud of all of his cross country students. “We have almost 50 kids putting in all of this time and effort, four days a week … The boys and girls running, they all blew me away. We had a successful season all around, and I’m proud of what they’ve accomplished,” Davies said.